Mike Agugliaro, co-owner of Gold Medal Service, speaks out on carbon monoxide poisoning in New Jersey homes. Making an investment into proper prevention and alarms can help you avoid tragedy and rest easy in your own home. Carbon monoxide poses a real danger to homeowners no matter the season or condition of a home. Gold Medal Service, an award-winning heating, cooling, plumbing, waterproofing, and electrical home service company, encourages homeowners to educate themselves about this poisonous gas and offers tips and preventative services to New Jersey residents and beyond. Carbon monoxide is a colorless, odorless, and tasteless gas that is produced by the incomplete combustion of fuels including wood, natural gas, diesel, gasoline, kerosene, coal and charcoal. While usually associated with automobiles and industrial machines, certain household appliances can produce the gas, especially if they are either not working correctly or out-of-date. Typical sources are home furnaces, water heaters, stoves, space heaters, and gas dryers, while fireplaces can become carbon monoxide hazards, particularly when a home is well-sealed for energy efficiency. Ensuring all appliances associated with the gas are installed and operating according to their manufacturer’s specifications. Having a home’s heating and duct system professionally inspected to identify any leaks or blockages. Reducing the operation of portable generators and any other fuel-burning devices inside and if needed, doing so with windows and doors open. Having your home inspected to ensure all vents and chimneys are not blocked and have all outdated appliances upgraded to new models. To find out more about Gold Medal Service’s specialized carbon monoxide services, visit http://goldmedalservice.com or call 1-800-553-6060. Gold Medal Service, rated A+ by the Better Business Bureau, was founded in New Jersey in 1994 with just two employees. Their vision was to provide homeowners with a reliable and trustworthy home service company customers could count on to fix just about anything that could go wrong in a home. 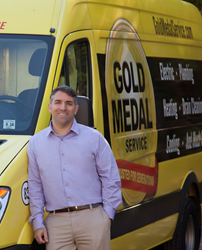 Since then, Gold Medal has grown to include more than 150 employees and technicians solving plumbing, heating, cooling, electric, drain, waterproofing, and sewer issues for homeowners across the state of New Jersey. Gold Medal Service is an Angie’s List “Super Service Award” recipient. For more information, call 800-576-GOLD or visit http://www.goldmedalservice.com.